A German soldier's moment of death is captured on film as he throws up his hands; his Mauser 98k falls to the ground. 460,000 German soldiers were killed by partisans in Ukraine during World War II. This photo, probably taken in late summer or early fall 1943, could be a staged Soviet propaganda photo or a frame from a still film. 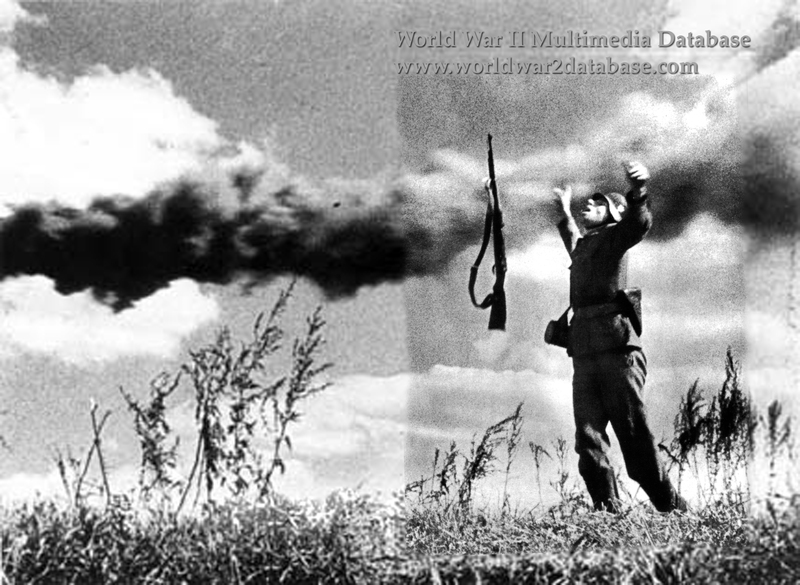 Since it was declassified after the war, it is possible it was taken by a German photographer during the Battle of Kharkov or Kiev and was part of a Soviet intelligence portfolio. According to the Ukranian government, 5.3 million Ukrainians were killed in World War II and 2.3 million were displaced as a result of the German invasion.